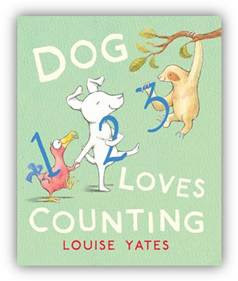 Lara was sent a copy of Dog Loves Counting by Louise Yates which I thought would make a perfect bedtime story. In the book, the little white dog is having trouble drifting off to sleep and his attempts to count sheep don't seem to have helped so he sets out in search of other things to count. Dog is a bit of a bookworm so he starts exploring his books to look for animals to count and soon finds a lone dodo (that makes one) plus himself (two) and a very cute and cuddly three-toed sloth (three). He carries on with his new friends and eventually finds ten creatures, each of whom is in some way related to the number they represent. I loved the simple sketches on each page but I particularly liked the fact that each animal was annotated with the numbers; the armadillo for instance has each of his bands numbered. With Lara sat next to me, she finds it hard to resist counting along and spotting all the numbers. Lara has enjoyed finding out about the different animals in the story; I'll admit that we had never talked about armadillos or three-toed sloths together before reading this book! At the end of Dog Loves Counting all of the animals look up to the sky to count the stars. I think this is slightly lost on Lara because it is immediately preceeded by all of the animals searching frantically for their friends. While I find the star-spotting a beautifully poetic ending to the story (and I love the illustrations to go with it), all that Lara remembers about the end of the story is that they finally found their friend! You can find out more about Louise Yates on her website. Labels: book review , children's books.